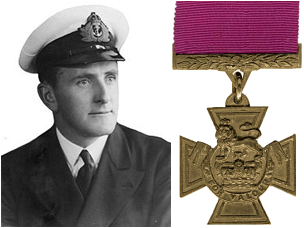 Commander John Wallace Linton, V. C., D. S. O., D. S. C.
H. M. Submarine Turbulent, Royal Navy, died 23rd March 1943, aged 37. Panel 72 Column 3. Son of Edward Maples Linton and Margaret Gertrude Linton; husband of Nancy Kate Linton. Citation: The citation in the London Gazette of 21st May, 1943, gives the following details: From the outbreak of war until H.M.S. Turbulent's last patrol, Commander Linton was constantly in command of submarines, and during that time inflicted great damage on the enemy. He sank one cruiser, one destroyer, one U-boat, twenty-eight supply ships, some 100,000 tons in all, and destroyed three trains by gunfire. In this last year he spent two hundred and fifty-four days at sea, submerged for nearly half the time, and his ship was hunted thirteen times and had two hundred and fifty depth charges aimed at her. His many and brilliant successes were due to his constant activity and skill, and the daring which never failed him when there was an enemy to be attacked. Captain Frederick Thornton Peters, V. C., D. S. O., D. S. C. and Bar. (Distinguished Service Cross U. S. A.). H. M. S. Excellent, Royal Navy, died 13th November 1942, aged 53. Panel 61 Column 3. Son of Frederick and Bertha Hamilton Peters, of Nelson, British Columbia, Canada. Citation: The citation in the London Gazette of 14th May, 1943, reads : For valour in taking H.M.S. Walney, in an enterprise of desperate hazard, into the harbour of Oran on 8th November, 1942. 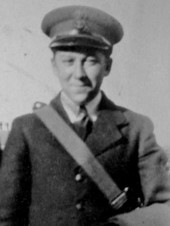 Captain Peters led his force through the boom towards the jetty in the face of point-blank fire from the shore batteries, a destroyer and a cruiser. Blinded in one eye, he alone of the seventeen officers and men on the bridge survived. The Walney reached the jetty disabled and ablaze, and went down with her colours flying. 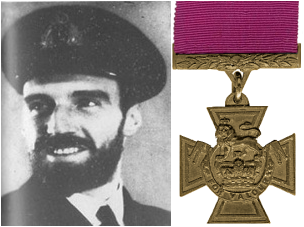 Lieutenant-Commander Gerard Broadmead Roope, V. C.
H. M. S. Glowworm, Royal Navy, died 8th April 1940, aged 35. Panel 36 Column 3. Son of Gerard and Florence Roope; husband of Faith D. Roope, of Richmond, Surrey. Citation: The citation in the London Gazette of 6th July 1945, gives the following details:- On 8th April, 1940, H.M.S. Glowworm was proceeding alone towards West Fjord, Norway, when she met and engaged two enemy destroyers, hitting at least one of them. The enemy broke off the action and headed north. Lieutenant-Commander Roope, though appreciating the intention of the enemy to lead him on to his supporting forces, gave chase. The German heavy cruiser, Admiral Hipper was sighted closing the Glowworm at high speed, and an enemy report was sent, which was received by H.M.S. Renown. Because of the heavy sea it was not possible for the Glowworm to shadow the enemy, and the Commanding Officer decided to attack. Ten torpedoes were fired without success; then the Glowworm, badly hit and her speed reduced, closed and rammed the Admiral Hipper. As she withdrew the Glowworm opened fire again, and scored one hit at 400 yards range. Badly stove in forward and riddled with enemy fire, the Glowworm heeled over, and the Commanding Officer gave the order to abandon her. Shortly afterwards she capsized and sank; only 31 out of her complement of 149 were saved. 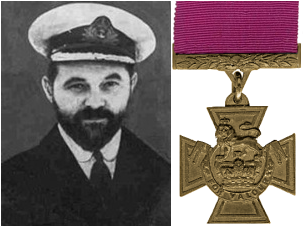 The Victoria Cross is bestowed upon Lieutenant Commander Roope in recognition of his great valour. 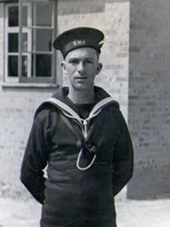 P/JX130821 Petty Officer Alfred Edward Sephton, V. C.
H. M. S. Coventry, Royal Navy, died 18th May 1941, aged 30. Panel 46 Column 2. Son of Alfred Joseph and Annie Sephton. Citation: The citation in the London Gazette of 28th November, 1941, reads: Petty-Officer Sephton was director-layer when H.M.S. Coventry was attacked by aircraft, whose fire grievously wounded him. In great pain and faint from loss of blood he stood fast, doing his duty without fault until the enemy was driven off. Thereafter until his death his valiant and cheerful spirit gave heart to the wounded. His high example inspired his shipmates and will live in their memory. 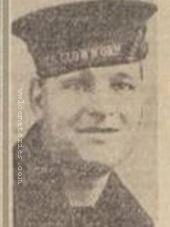 H. M. Submarine Upholder, Royal Navy, died 14th April 1942, aged 30. Panel 61 Column 3. Son of William Lumb Wanklyn and Marjorie Wanklyn; husband of Elspeth Wanklyn. Citation: The Citation in the London Gazette of 16th December, 1944, gives the following details: On 24th May, 1941, while off the coast of Sicily, Lieutenant-Commander Wanklyn, in command of H.M. Submarine Upholder, sighted an enemy troop convoy escorted by destroyers. Observation by periscope could not be relied on, owing to failing light, and a surface attack would have been easily seen. Upholder's listening gear was out of action. Despite these difficulties, Lieutenant-Commander Wanklyn, though aware of the risk of being rammed by the escorting destroyers, pressed home his attack and sank a large troopship. The destroyers at once counter-attacked, and dropped thirty-seven depthcharges. With great courage, coolness and skill, and without listening gear, Lieutenant-Commander Wanklyn brought Upholder clear and back to harbour. 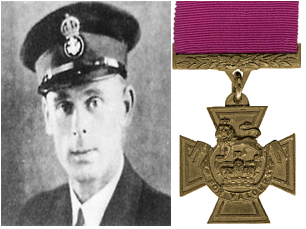 Before this outstanding attack and since being made a Companion of the Distinguished Service Order, Lieutenant-Commander Wanklyn had torpedoed a tanker and a merchant vessel. 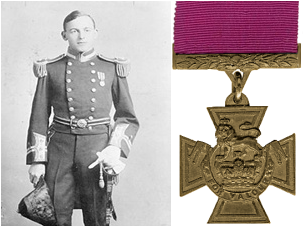 He continued to show the utmost courage in the face of the enemy, and carried out attacks on enemy vessels with skill and relentless determination, sinking one destroyer, one U-boat, two troop transports, one tanker and three supply ships. He also probably destroyed, by torpedoes, one cruiser and one destroyer, and probably hit another cruiser. 24th June 1942, aged 23. Son of Harold Victor and Eliza Thomas, of Birkenhead, Cheshire. His body was never recovered. HMS Gossamer was a member of the Halcyon Class and she was a minesweeper assigned to Russian Convoy duties. Whilst at anchor on the 24 June 1942 at Kola Inlet near Murmansk, North Russia, she was bombed and sunk with the loss of 24 crew, including George H. A. Thomas. He was 23 years old. His name is recorded on the "World War 2 Birkenhead Roll Of Honour 1939 - 1945" in Birkenhead Town Hall, Hamilton Square, Birkenhead and the H.M.S. Gossamer memorial at St Bartholomew's Church, Penn, Wolverhampton. 8th April 1940, aged 19. Son of Aaron C. and Beatrice Wiltshire.